◊ A commemorative Collector's Edition of Jethro Tull's classic 1971 album, featuring new stereo and 5.1 surround sound mixes by Steven Wilson. ◊ The superb package comes with a 48 page hardback book featuring detailed liner notes, a new Ian Anderson interview, Q&A's with engineer John Burns, notes from Steven Wilson, lyrics, rare photos, and reflections from Jeffrey Hammond-Hammond, Martin Barre, Clive Bunker, Barrie Barlow, Glenn Cornick, Terry Ellis and Jennie Franks (Ian Anderson's first wife and lyricist for title track Aqualung). Other: Releases: ◊ In April 1971, Aqualung peaked at number 4 on the UK Album Chart; when the CD version was released in 1996, it reached number 52. It peaked at #7 on the Billboard Music Charts' North American pop albums chart; the single "Hymn 43" hit #91 on the Billboard Hot 100 chart. The album would go on to sell over seven million copies, and is the band's best-selling album. 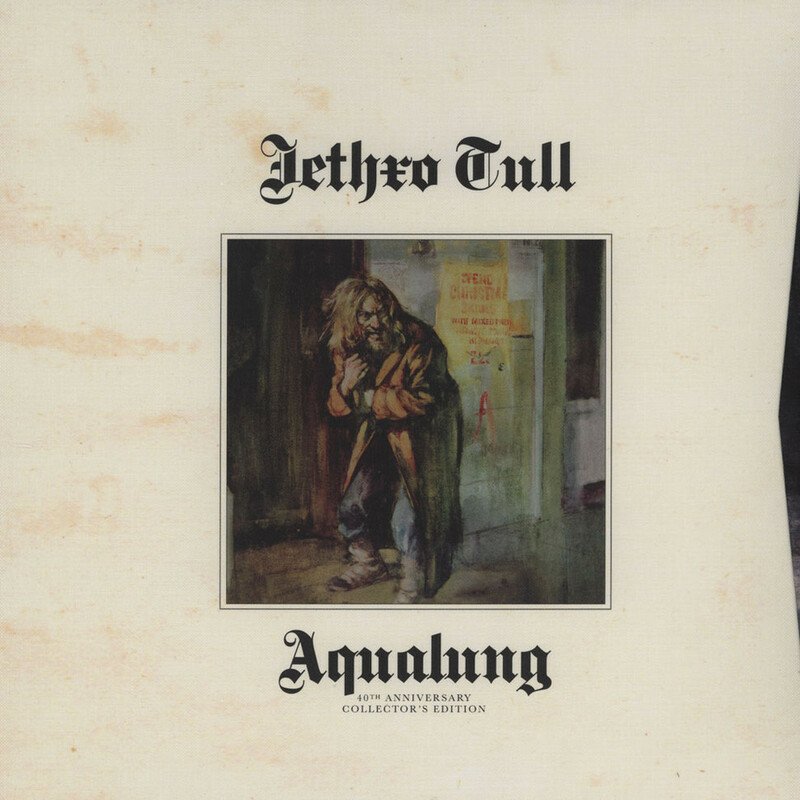 Aqualung was one of only two Jethro Tull albums released in quadraphonic sound, the other being War Child. The quadraphonic version of "Wind Up", which is in a slightly higher key, is included on the later CD reissue of the album as "Wind Up (quad version)". The album's only single was "Hymn 43", which was released on 14 August 1971. It reached number 91 on the Billboard Hot 100 charts, spending two weeks in the chart. The song was the first single released by the band in the United States. It was later included in the video game Rock Band 2 as downloadable content; which also featured the album's title track. ◊ The album was re-released in a fortieth anniversary edition on 31 October 2011. The release contains a new stereo and 5.1 surround remix of the album by Porcupine Tree's Steven Wilson, and comes in two different editions—a "collector's edition" containing the album on LP and two CDs, as well as DVD and Blu-ray discs and a hardback book; and a "special edition" containing the two CDs and an abridged version of the book. ◊ On its release, Aqualung was met with favourable reviews. Rolling Stone lauded its "fine musicianship", calling it "serious and intelligent", although feeling that the album's seriousness "undermined" its quality. Sounds said that its "taste and variety" made it the band's "finest" work. Robert Christgau, however, was more critical of the album, rating it a C+, and calling Anderson's lyrics "inchoate" and "pretentious". ◊ Allmusic give the album four-and-a-half stars out of five, calling it "a bold statement" and "extremely profound". Steve Harris, the bass player for the heavy metal band Iron Maiden, has called Aqualung "a classic album", lauding its "fantastic playing, fantastic songs, attitude [and] vibe". Iron Maiden would go on to cover "Cross-Eyed Mary" as the B-side of their 1983 single "The Trooper". ◊ Aqualung has also been appraised highly in retrospective listings—Rolling Stone included it on their list of "The 500 Greatest Albums of All Time", at number 337, whilst UK magazine Q listed it a number 7 in their "40 Cosmic Rock Albums" countdown. Martin Barre's solo on the album's title track was included in Guitarist magazine's list of "The 20 Greatest Guitar Solos of All Time" at number 20. ◊ Glenn Cornick: bass guitar (played with the band at rehearsals for the album in June 1970, some of which may also have been recording sessions, although he is not credited on the album). 1 x 180g LP / 2CD / DVD / Blu-Ray plus 48page hard back book, presented in a hardback slipcase. 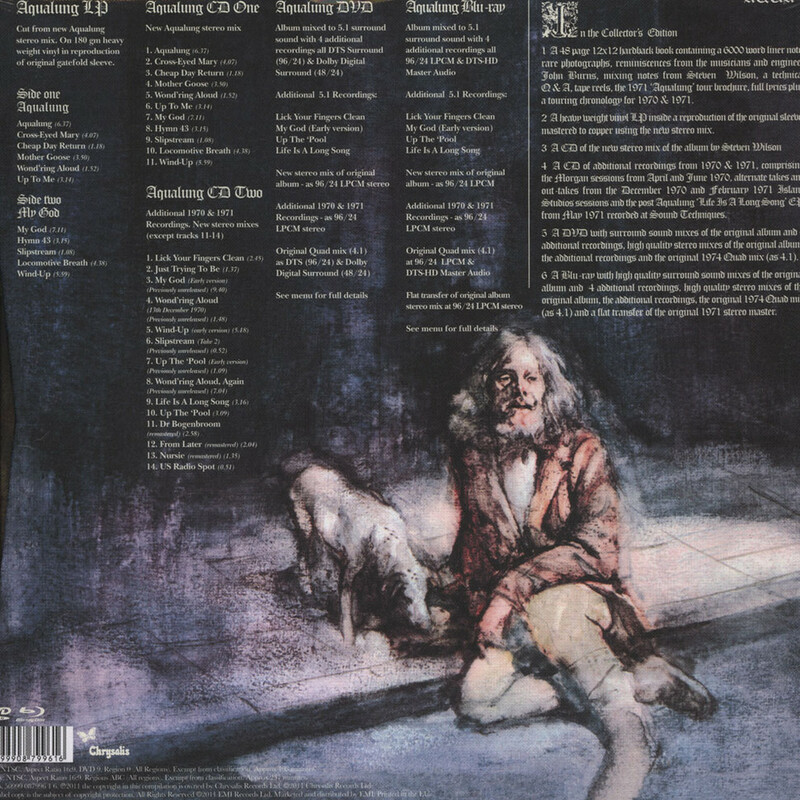 * Cut from new Aqualung Stereo Mix on 180 gm heavy weight vinyl in reproduction of original gatefold sleeve. CD2 ? Additional 1970 &1971 Recordings including some previously unreleased new stereo mixes.